I am SOOOO glad that it is FRIDAY! Oh my word what a crazy last couple of days! I’ve been wanted to do a little stamping…I LOVE making fall cards. LEAVES…it’s ALL about LEAVES! LOL!! Anyway I haven’t done any challenges in a while and thought I’d put a couple together. 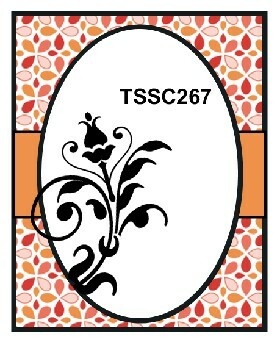 This is for the Free For on Splitcoast Stampers and for the CASology 269 challenge for GRID. I think this is a happy and easy FALL card! Copper Foil – cut out detailed leaf and add to card front to finish off. In case you didn’t know…our Create with Connie and Mary OCTOBER 2017 MINI SESSION is coming on the 11th! Oh…HAPPY NOVEMBER everyone! WOW…I can’t believe it…the year is quickly coming to and end. AMAZING! This week we have a really cool sketch for you and I have to say…I took some liberties with it but REALLY like the way it turned out. I’ve seen this ribbon treatment on several cards and this is the first time I’ve tried it. LOVE the look! Very Vanilla – 5 1/8 x 3 7/8 run through the Pretty Paisleys folder, layer onto Soft Suede – 5 1/4 x 4 and add to card front. Stamp acorns using Delightful Dijon and Soft Suede, punch out, layer acorn tops on acorn bottoms then layer together. 5/8″ Burlap Ribbon – fold like picture and use staple to secure. Make two and layer behind the acrons. Add acorns to the card front using dimensionals. It’s a little difficult to see in the picture, but remove back from some Perfect White Accents and add to card front using Tombow Glue. 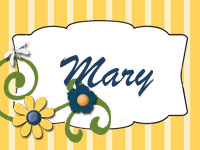 The design team has such GREAT ideas so head over to Create with Connie and Mary and check out all their great cards! to the SPECIAL PRICE of $19.95 US! so you still have at least SIX months to use these fantastic ideas! Get ready for classes next year! including card sets, gift card holders, and much more! Features products in the Annual Catalog good for at least six more months! Exclusive to subscribers, these have not been shown anywhere! PLEASE NOTE: This is the edition we did last summer! We now use Fastwagon for our processing, you should immediately receive a Digital Order email with a link to a downloadable Welcome letter with your passwords! Please check your SPAM folder – the email will be from FastWagon! As many of you know, two week ago we found out that my sweet Gypsy girl was very ill (although she NEVER acted like she was). 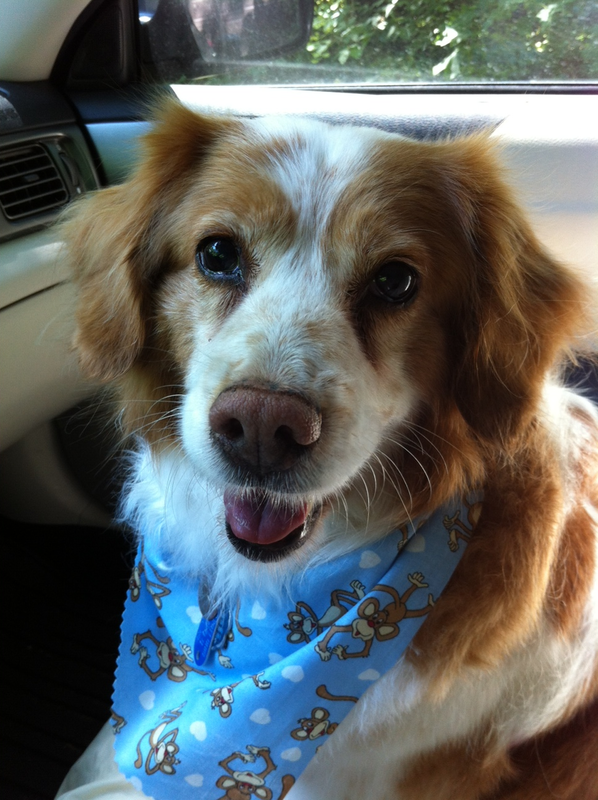 The vet found that she had an extremely large tumor in her liver and it seemed to be growing very quickly. The vet told us it wouldn’t be very long. Tonight (Saturday) around 8 pm Gypsy let us know that it was time. Up until then you really couldn’t tell she was sick…a little slower but still bouncing when you said ‘puppy treat’ or ‘chicken noodle soup’. It is a very sad day. Bandit, as you know, adored his ‘big sis’ and he is beside himself right now. Hopefully it will get easier for him. So to all you wonderful people who have been sending your thoughts and hugs to Gypsy…she wanted to tell you that she will miss you all and thanks for coming by to see her all the time (oh and do stamp classes with her mom!). And a very special big hug to ‘auntie Karen’…her very first aunt. Well it’s Monday again and time for the Technostamper Monday Lunchtime Sketch Challenge. I absolutely LOVE this new set and just couldn’t wait to start using it. 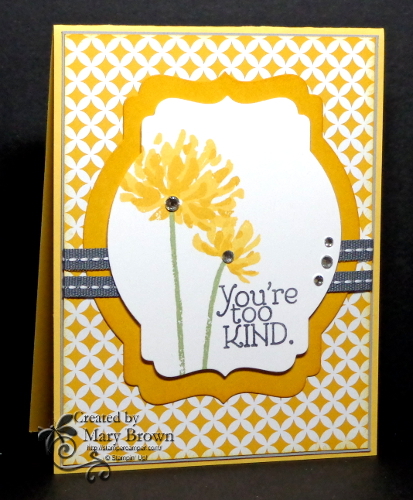 The base of the card is Daffodil Delight. I took a print from the Eastern Elegance pack, layered on Smoky Slate (it’s a very tiny border), added a Crushed Curry Deco Frame then wrapped two pieced of the Basic Grey Stitched 1/4″ Grosgrain ribbon. This is added to the card base. Next I cut out the next smallest Deco Frame in Whisper White. I stamped the stems in Pear Pizzazz, the larger of each flower in Daffodil Delight then the smaller of each flower in Crushed Curry. I stamped the greeting in Basic Grey then added to the card front using dimensionals. I added some Basic Rhinestones to finish it off. Isn’t this just a great simple sketch…so many options! So while YOU are waiting….why not join the fun? We’d love to have you play along! Don’t forget to check out the other members of the team and remember go to the Technostamper blog to play along!